And we were off to the races this week! And what a week it was. Our first liners (small plants with a root ball the size of a quarter) came on a semi from California Monday morning. 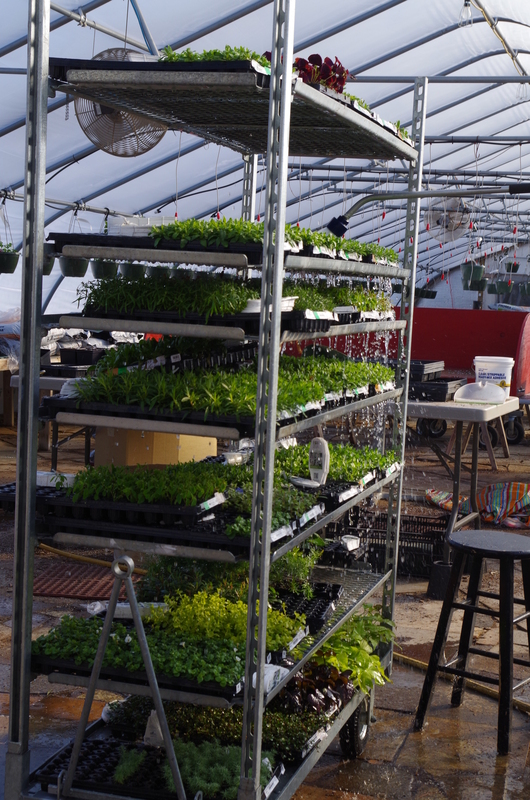 There were nearly 10,000 plants on that pallet and all were in beautiful condition. We were so excited to get our hands dirty! But first they had to wait a day so we could get flats filled with pots and soil. Jeanie spent Monday getting started with the seeding. First the peppers, some of the herbs, marigolds to put in early planters. 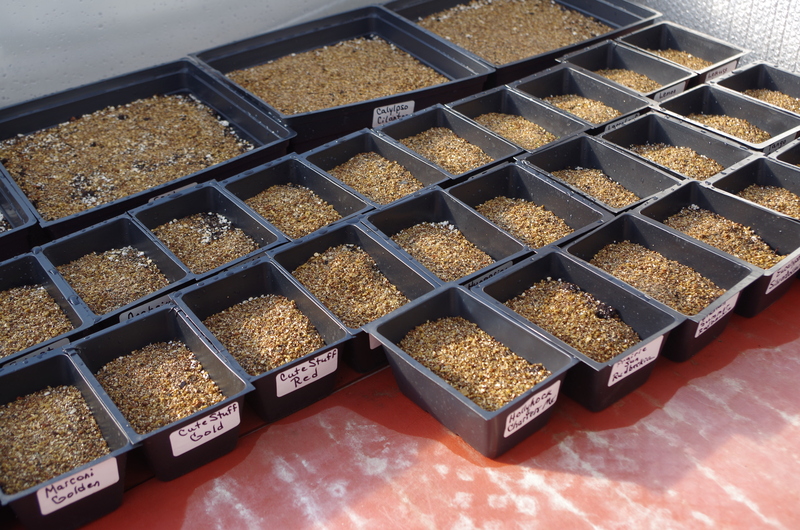 One of the heaters in Ruby’s House wasn’t working properly, but one night of cold wouldn’t hurt the freshly seeded trays. Tuesday brought very cold temperatures. The high was a couple of degrees below zero and the wind howled from the west. Our propane provider loves days like this, as long as he doesn’t have to do any emergency furnace repairs! Jeanie’s next job was to take cuttings of the few stock plants we keep over. These are from plants that are hard to find (and tolerate our neglect over the winter!). We are careful not to take cuttings from plants which are patented. 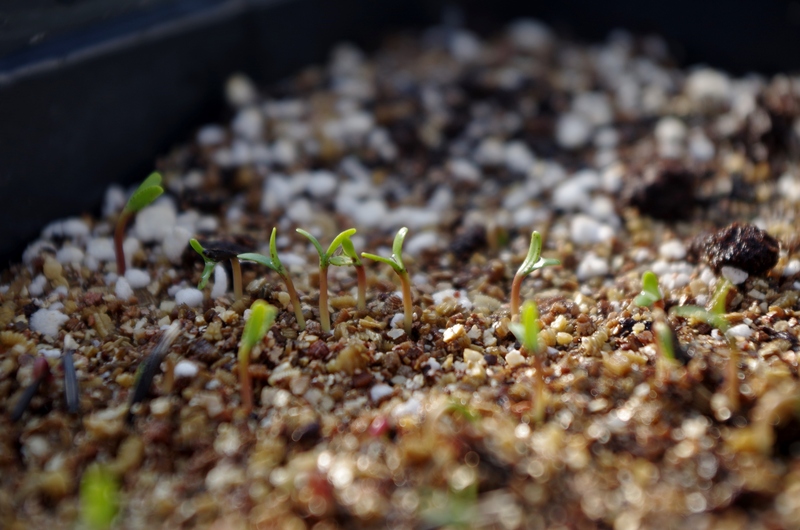 Most of the cool, new varieties are patented, so if we do propagate them, we need to pay royalties. The nice full tray on the left is our favorite scented geranium, Mabel Gray. She has the best lemon scent and is exceedingly difficult to root out. 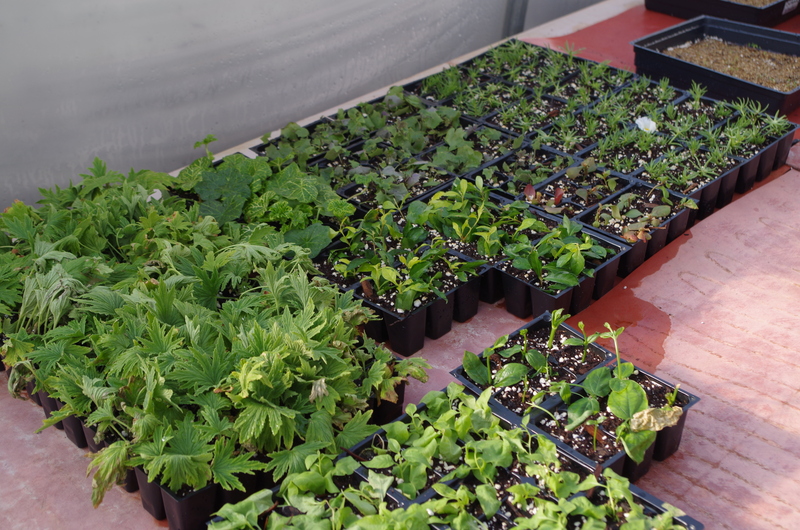 If there are 45 cuttings, we can probably count on 10 plants. That is why most commercial growers leave her alone. Most of our geraniums also came in Tuesday. The FedEx truck and our staff had to plow their way through a nasty snow bank to get in and out of the yard. Wednesday was also bitterly cold. Lori and Cathy and Kaitlin planted up as many hanging baskets as possible, as well as some of the regular pots. Our scheduling is very awkward the first few weeks. It would be nice if everything could be planted as soon as it arrives. But because each variety of plant goes into several different types of containers, and we grow some of all of them in Rosie’s House and the extra go in to Ruby’s House, the planting gets staggered. Top that with the fact that the liners come from about 8 different growers, all shipping at different times, and we sometimes feel like we are herding cats! So on Wednesday, all my best laid plans were challenged. We are not sure why, but one of our major suppliers (also from the frigid north) decided to ship 3 cases of tender liners ground in minus zero temperatures. 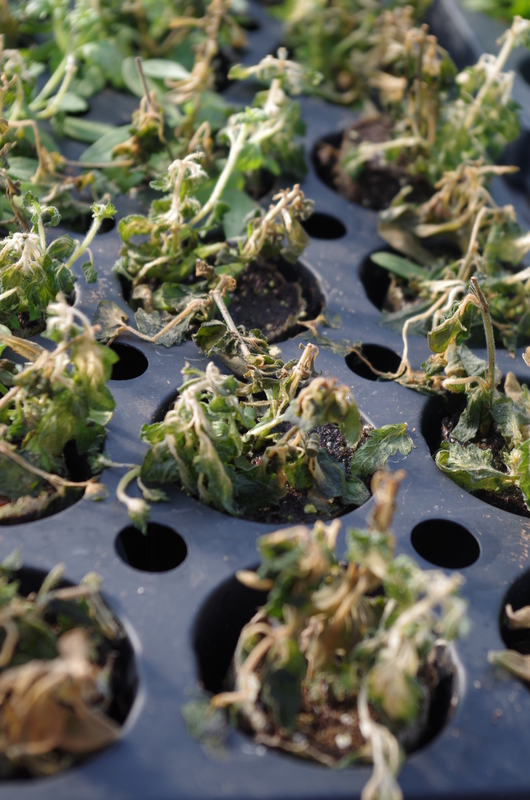 In nearly 50 years, we have never received cases of plants that were frozen solid into the center of the box! That threw a monkey wrench into our plans in so many ways. These plants had been ordered in August so availability was an issue. We won’t receive replacements for what is available until the middle of next week. And the smell of frozen plants is nasty! And today we received a case that had been shipped Next Day Air on Tuesday (also frozen). Did you know that Friday is the day after Tuesday? On the bright side, Thursday morning we woke up to minus 19 degrees Fahrenheit but it warmed up to 24 above! And today we saw 40 degrees. Spring is coming! Don’t forget to sign up for our container workshops and Dirty Dining! Please please please, could I get a Mabel grey geranium? I would take very good care of her. Of course you may have a Mabel! As long as she cooperates and has babies. 😉 We will put your name on one. Next Things are looking up! But don’t get too excited.